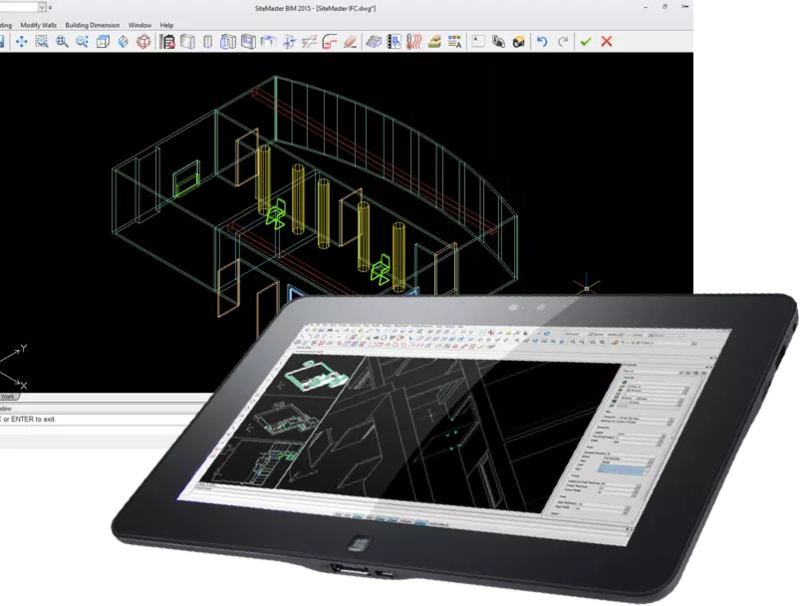 SiteMaster™ is a whole new product line of comprehensive mobile building CAD applications built on top of the ARES CAD Software technology. Unlike the traditional tape, pen, and paper method, SiteMaster software solutions enable surveyors around the world to capture measurements directly & digitally in real time, creating instant CAD drawings on-site in .DWG, .DXF and/or .IFC. The SiteMaster Product Line is designed to seamlessly work in perfect conjunction with modern Bluetooth-enabled Laser Distance Meters, such as the Leica Distos, ensuring a paperless, quick and accurate surveying process. The CAD plans are created on the fly while you measure and can thus be evaluated on-site to check any inconsistencies before returning to the office. Work more efficient and productive – with higher quality results. 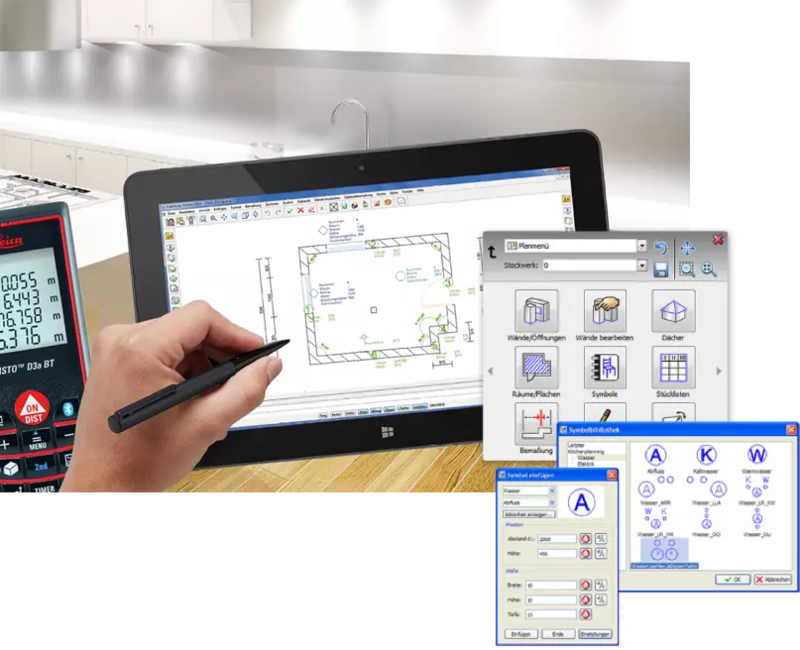 SiteMaster Kitchen enables kitchen surveyors to work 100% paperless. By digitalizing the workflows, SiteMaster Kitchen simply cuts both conversion time back in the office and measuring time on site in half. SiteMaster Kitchen works in synergy with Kitchen planning solutions such as CARAT, Wiener Design or KPS to name a few. The role of our solution will be to create or check a highly-reliable 3D model of the room. The exact location of obstacles, openings, water supply and electrical sockets can also be added. The model is further shared with the Kitchen planning software. Generate a 3D BIM model of the building you are surveying. The IFC files that are generated can be further imported in BIM software for creation or modification. 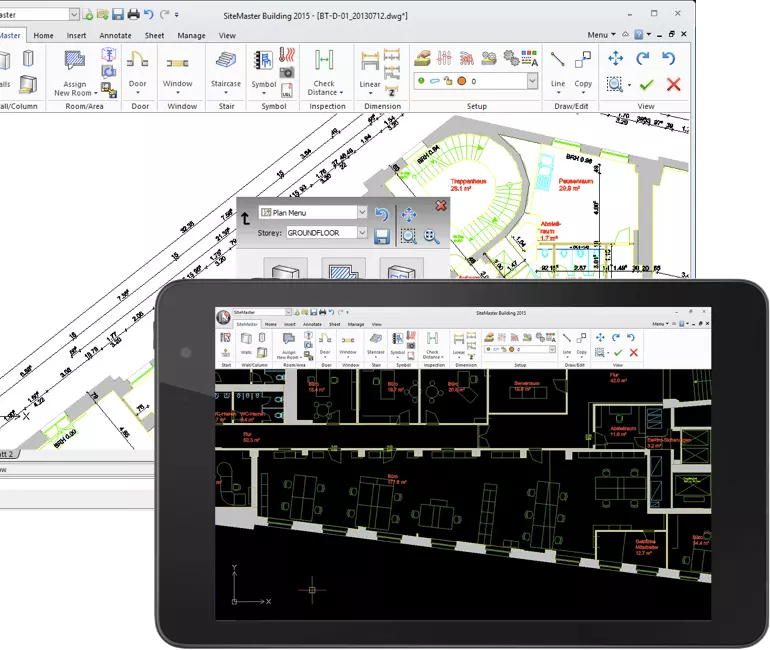 Incorporate BIM into your surveying projects and increase data transparency with SiteMaster BIM. SiteMaster BIM allows professionals to survey and create accurate IFC object structures for BIM projects, eliminating tracing and modelling work at the office. SiteMaster Building is designed for professionals who need to measure quickly and a high number of square meters with varying wall thickness. With this easy-to-use building surveying solution, professional can measure and get calculations on-site with a near finished 2D drawing. 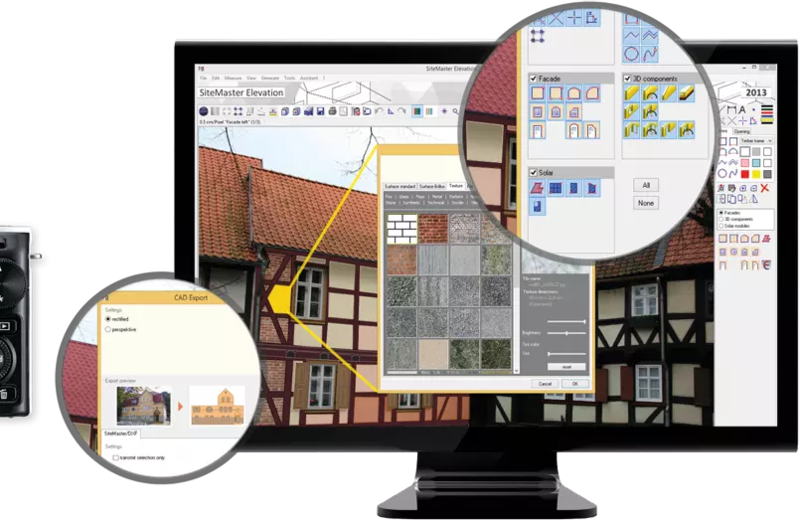 Bring real-life data to your drawings. SiteMaster Elevation allows everyone to use the advantages of photogrammetric procedures to determine detailed measurements from freehand digital photographs or scanned images. True for all SiteMaster solutions: The mobility and flexibility with on-site surveying grants fast and accurate working. The solutions – optimized for all platforms running on Windows – are especially tailored for mobile devices with limited processing power and digital modern industry workflows in mind. With SiteMaster® surveying software solutions and worldwide building surveying services, Graebert iSurvey is disrupting the Building Surveying Industry. The SiteMaster solutions were used to survey Millions of squared meters in half the time, and at half the cost, for prestigious customers such as McDonalds®, Bank of America®, Atkins®, Abercrombie & Fitch®, Deutsche Telekom®, Deutsche Bahn®.